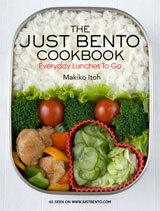 This month's Japanese Kitchen article in The Japan Times is about a quietly growing trend in Japan: artisanal rice. Rice farmers had been protected by the government for decades, but now those protections seem to be set to erode even more (they've already been reduced quite a bit). One way some farmers are coping with this is to concentrate on making high quality, organic rice only. The rice produced like this is still in very short supply (the farm I mentioned, Nonki Farm in Harie, Shiga prefecture, has already sold out of most of this year's harvest) and expensive, but I think it's a trend that is set to increase. Japanese rice farms are usually quite small, and can't really compete on the price level with cheap imported rice that's grown on vast fields in the U.S. or China. So...why not go high end? I've tried some of this year's new harvest rice from Nonki Farm (a variety with the delectable name of Milky Queen) and it was absolutely delicious - sweet, and juicy even, which is a strange thing to say about rice maybe, but it really was that good. Besides regular rice, some farms are growing heirloom varieties of rice. 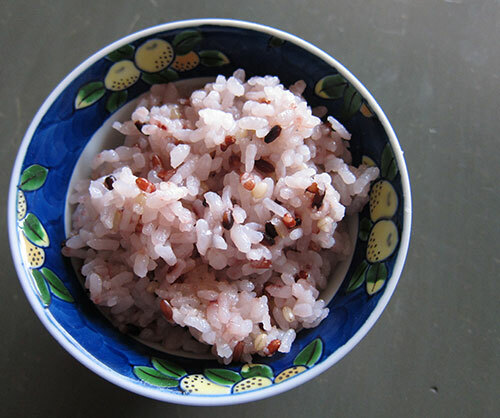 The photo above is a closeup of a mixed bag of such 'kodaimai' or ancient rice varieties. Here is some regular rice cooked with a handful of the kodaimai mix. The black rice turns the white rice purple. Taste-wise there isn't a big difference, although the kodaimai is mochi rice (sweet rice) so it adds a stickier texture. Incidentally, the "nonki"(呑気) of Nonki Farm means easygoing, carefree and optimistic. What a lovely name for a farm, don't you think? We should all be a bit more nonki. Submitted by maki on 2013-11-22 13:49. Mixed rices are becoming popular in the USA also, but on a small basis. 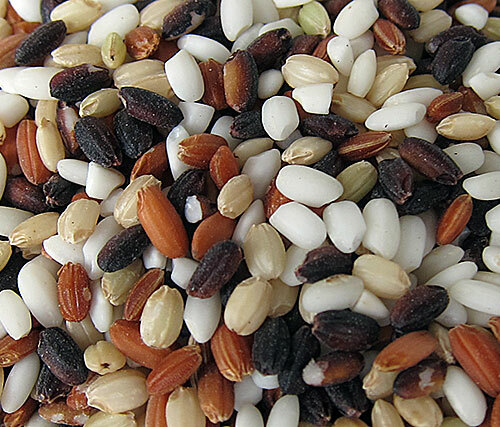 A California blend contains CalMati Brown Rice, Wild Rice, Sweet Brown Rice, and Heirloom Red Rice. A similar blend from Texas contains Texmati, White, Brown, Wild, and Red. These are more expensive than regular white rice. I was not aware that American rice was now allowed to be sold in Japan since Japanese rice farmers had the clout to keep other rices out, much as American sugar farmers have the clout to keep our sugar prices higher than the world market price. Ultimately the small rice farmers growing artisanal and heirloom rices in Japan should find a ready market among those able to pay for them. These simple grains look so beautiful. I'll be looking out for this rice. Whether it's bad or good, rice is the main source of food for most asian, including me. The consensus these days is, wholemeal is best, but I found brown rice on its own is very hard to eat. So I've taken the approach of mixing other grains into my normal white rice when cooking. Similar to what the koreans would call Japgok-bap (잡곡밥). I would mix my 4 cups of white rice with 1 cup of mixed grain, which can be anything from barley to millet, mung beans, adzuki beans, black rice, brown rice, split peas. The list just goes on. What grains I choose depends on what I feel like that day. Your bowl of rice looks like the one I usually make when I mix in either black rice or adzuki beans. I'm hoping to tip the ratio to 3 cups and 2 cups, but I'm not there yet.